Lobsters are a family (Nephropidae, sometimes also Homaridae) of large marine crustaceans. Lobsters have long bodies with muscular tails, and live in crevices or burrows on the sea floor. Three of their five pairs of legs have claws, including the first pair, which are usually much larger than the others. Highly prized as seafood, lobsters are economically important, and are often one of the most profitable commodities in coastal areas they populate. Commercially important species include two species of Homarus (which looks more like the stereotypical lobster) from the northern Atlantic Ocean, and scampi (which looks more like a shrimp, or a "mini lobster") – the Northern Hemisphere genus Nephrops and the Southern Hemisphere genus Metanephrops. Although several other groups of crustaceans have the word "lobster" in their names, the unqualified term "lobster" generally refers to the clawed lobsters of the family Nephropidae. Clawed lobsters are not closely related to spiny lobsters or slipper lobsters, which have no claws (chelae), or to squat lobsters. The closest living relatives of clawed lobsters are the reef lobsters and the three families of freshwater crayfish. Lobsters are invertebrates with a hard protective exoskeleton. Like most arthropods, lobsters must moult to grow, which leaves them vulnerable. During the moulting process, several species change color. Lobsters have eight walking legs; the front three pairs bear claws, the first of which are larger than the others. Although lobsters are largely bilaterally symmetrical like most other arthropods, some genera possess unequal, specialized claws. Lobster anatomy includes two main body parts: the cephalothorax and the abdomen. The cephalothorax fuses the head and the thorax, both of which are covered by a chitinous carapace. The lobster's head bears antennae, antennules, mandibles, the first and second maxillae. The head also bears the (usually stalked) compound eyes. Because lobsters live in murky environments at the bottom of the ocean, they mostly use their antennae as sensors. The lobster eye has a reflective structure above a convex retina. In contrast, most complex eyes use refractive ray concentrators (lenses) and a concave retina. The lobster's thorax is composed of maxillipeds, appendages that function primarily as mouthparts, and pereiopods, appendages that serve for walking and for gathering food. The abdomen includes pleopods (also known as swimmerets), used for swimming as well as the tail fan, composed of uropods and the telson. Lobsters, like snails and spiders, have blue blood due to the presence of hemocyanin, which contains copper. In contrast, vertebrates and many other animals have red blood from iron-rich hemoglobin. Lobsters possess a green hepatopancreas, called the tomalley by chefs, which functions as the animal's liver and pancreas. Lobsters of the family Nephropidae are similar in overall form to a number of other related groups. They differ from freshwater crayfish in lacking the joint between the last two segments of the thorax, and they differ from the reef lobsters of the family Enoplometopidae in having full claws on the first three pairs of legs, rather than just one. The distinctions from fossil families such as the Chilenophoberidae are based on the pattern of grooves on the carapace. Typically, lobsters are dark colored, either bluish green or greenish brown as to blend in with the ocean floor, but they can be found in a multitude of colors. Lobsters with atypical coloring are extremely rare, accounting for only a few of the millions caught every year, and due to their rarity, they usually aren't eaten, instead released back into the wild or donated to aquariums. Often, in cases of atypical coloring, there is a genetic factor, such as albinism or hermaphroditism. Notably, the New England Aquarium has a collection of such lobsters, called the Lobster Rainbow, on public display. Special coloring doesn't appear to have an effect on the lobster's taste once cooked; with the exception of albinos, all lobsters possess astaxanthin, which is responsible for the bright red color lobsters turn after being cooked. albino 1 in 100,000,000 Also called white; transluscent; ghost; crystal. "cotton candy" 1 in 100,000,000 Also called pastel. Possibly a sub-type of albino. blue 1 in 1,000,000 to 1 in 2,000,000 Caused by a genetic defect. split-colored 1 in 50,000,000 Almost all split-coloreds are hermaphroditic. Lobsters live up to an estimated 45 to 50 years in the wild, although determining age is difficult. In 2012, a report was published describing how growth bands in calcified regions of the eyestalk or gastric mill in shrimps, crabs and lobsters could be used to measure growth and mortality in decapod crustaceans. Without such a technique, a lobster's age is estimated by size and other variables; this new knowledge "could help scientists better understand the population and assist regulators of the lucrative industry". Research suggests that lobsters may not slow down, weaken or lose fertility with age, and that older lobsters may be more fertile than younger lobsters. This longevity may be due to telomerase, an enzyme that repairs long repetitive sections of DNA sequences at the ends of chromosomes, referred to as telomeres. Telomerase is expressed by most vertebrates during embryonic stages, but is generally absent from adult stages of life. However, unlike most vertebrates, lobsters express telomerase as adults through most tissue, which has been suggested to be related to their longevity. Telomerase is especially present in 'Green Spotted' lobsters - whose markings are thought to be produced by the enzyme interacting with their shell pigmentation  Lobster longevity is limited by their size. Moulting requires metabolic energy and the larger the lobster, the more energy is needed; 10 to 15% of lobsters die of exhaustion during moulting, while in older lobsters, moulting ceases and the exoskeleton degrades or collapses entirely leading to death. Lobsters, like many other decapod crustaceans, grow throughout life and are able to add new muscle cells at each moult. Lobster longevity allows them to reach impressive sizes. According to Guinness World Records, the largest lobster ever caught was in Nova Scotia, Canada, weighing 20.15 kilograms (44.4 lb). Lobsters live in all oceans, on rocky, sandy, or muddy bottoms from the shoreline to beyond the edge of the continental shelf. They generally live singly in crevices or in burrows under rocks. Lobsters are omnivores and typically eat live prey such as fish, mollusks, other crustaceans, worms, and some plant life. They scavenge if necessary, and are known to resort to cannibalism in captivity. However, when lobster skin is found in lobster stomachs, this is not necessarily evidence of cannibalism – lobsters eat their shed skin after moulting. While cannibalism was thought to be nonexistent among wild lobster populations, it was observed in 2012 by researchers studying wild lobsters in Maine. These first known instances of lobster cannibalism in the wild are theorized to be attributed to a local population explosion among lobsters caused by the disappearance of many of the Maine lobsters' natural predators. In general, lobsters are 25–50 cm (10–20 in) long, and move by slowly walking on the sea floor. However, when they flee, they swim backward quickly by curling and uncurling their abdomens. A speed of 5 m/s (11 mph) has been recorded. This is known as the caridoid escape reaction. Symbiotic animals of the genus Symbion, the only member of the phylum Cycliophora, live exclusively on lobster gills and mouthparts. Different species of Symbion have been found on the three commercially important lobsters of the North Atlantic Ocean – Nephrops norvegicus, Homarus gammarus, and Homarus americanus. Lobster recipes include lobster Newberg and lobster Thermidor. Lobster is used in soup, bisque, lobster rolls, and cappon magro. Lobster meat may be dipped in clarified butter, resulting in a heightened flavor. Cooks boil or steam live lobsters. When a lobster is cooked, its shell's color changes from blue to orange because the heat from cooking breaks down a protein called crustacyanin, which suppresses the orange hue of the chemical astaxanthin, which is also found in the shell. According to the United States Food and Drug Administration (FDA), the mean level of mercury in American lobster between 2005 and 2007 was 0.107 ppm. In North America, the American lobster did not achieve popularity until the mid-19th century, when New Yorkers and Bostonians developed a taste for it, and commercial lobster fisheries only flourished after the development of the lobster smack, a custom-made boat with open holding wells on the deck to keep the lobsters alive during transport. 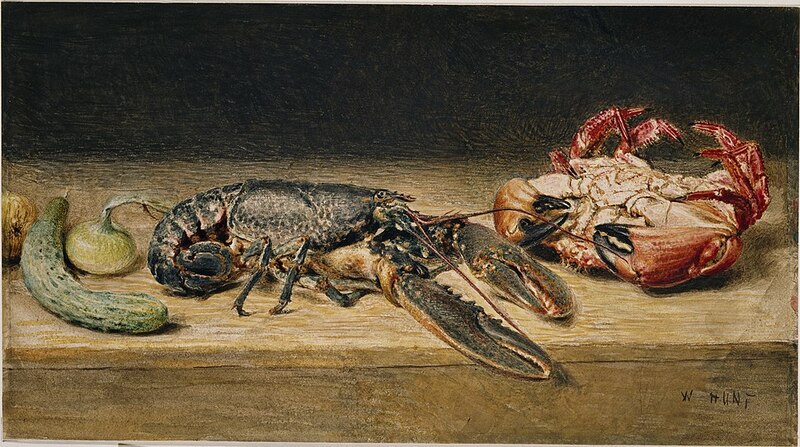 Prior to this time, lobster was considered a poverty food or as a food for indentured servants or lower members of society in Maine, Massachusetts, and the Canadian Maritimes. Some servants specified in employment agreements that they would not eat lobster more than twice per week, however there is limited evidence for this. Lobster was also commonly served in prisons, much to the displeasure of inmates. American lobster was initially deemed worthy only of being used as fertilizer or fish bait, and until well into the 20th century, it was not viewed as more than a low-priced canned staple food. Caught lobsters are graded as new-shell, hard-shell, or old-shell, and because lobsters which have recently shed their shells are the most delicate, an inverse relationship exists between the price of American lobster and its flavor. New-shell lobsters have paper-thin shells and a worse meat-to-shell ratio, but the meat is very sweet. However, the lobsters are so delicate, even transport to Boston almost kills them, making the market for new-shell lobsters strictly local to the fishing towns where they are offloaded. Hard-shell lobsters with firm shells, but with less sweet meat, can survive shipping to Boston, New York, and even Los Angeles, so they command a higher price than new-shell lobsters. Meanwhile, old-shell lobsters, which have not shed since the previous season and have a coarser flavor, can be air-shipped anywhere in the world and arrive alive, making them the most expensive. One seafood guide notes that an $8 lobster dinner at a restaurant overlooking fishing piers in Maine is consistently delicious, while "the eighty-dollar lobster in a three-star Paris restaurant is apt to be as much about presentation as flavor". Several methods are used for killing lobsters. The most common way of killing lobsters is by placing them live in boiling water, sometimes after having been placed in a freezer for a period of time. Another method is to split the lobster or sever the body in half lengthwise. Lobsters may also be killed or immobilized immediately before boiling by a stab into the brain (pithing), in the belief that this will stop suffering. However, a lobster's brain operates from not one but several ganglia and disabling only the frontal ganglion does not usually result in death. The boiling method is illegal in some places, such as in Reggio Emilia, Italy, where offenders face fines up to €495. Lobsters can be killed by electrocution prior to cooking, with one device, the CrustaStun, applying a 110-volt, 2 to 5 amp electrical charge to the animal. The Swiss government banned boiling lobster live without stunning them first; Since March 2018, lobsters in Switzerland need to be knocked out, or killed instantly, before they are prepared. They also get other protections while in transit. Lobsters are caught using baited one-way traps with a color-coded marker buoy to mark cages. Lobster is fished in water between 2 and 900 metres (1 and 500 fathoms), although some lobsters live at 3,700 metres (2,000 fathoms). Cages are of plastic-coated galvanized steel or wood. A lobster fisher may tend as many as 2,000 traps. Around year 2000, owing to overfishing and high demand, lobster aquaculture expanded. However, as of 2008, no lobster aquaculture operation had achieved commercial success, mainly because of lobsters' tendency towards cannibalism and the slow growth of the species. ^ Sammy De Grave; N. Dean Pentcheff; Shane T. Ahyong; et al. (2009). "A classification of living and fossil genera of decapod crustaceans" (PDF). Raffles Bulletin of Zoology. Suppl. 21: 1–109. Archived from the original (PDF) on June 6, 2011. ^ "Homarus americanus, American lobster" (PDF). McGill University. June 27, 2007. ^ Thomas Scott (1996). "Lobster". ABC Biologie. Walter de Gruyter. p. 703. ISBN 978-3-11-010661-9. ^ R. Quarmby; D.A. Nordens; P.F. Zagalsky; H.J. Ceccaldi; D. Daumas (1977). "Studies on the quaternary structure of the lobster exoskeleton carotenoprotein, crustacyanin". Comparative Biochemistry and Physiology Part B: Comparative Biochemistry. 56 (1): 55–61. doi:10.1016/0305-0491(77)90222-X. ^ Carlos Robles (2007). "Lobsters". In Mark W. Denny; Steven Dean Gaines (eds.). Encyclopedia of tidepools and rocky shores. University of California Press. pp. 333–335. ISBN 978-0-520-25118-2. Retrieved July 27, 2013. ^ M. F. Land (1976). "Superposition images are formed by reflection in the eyes of some oceanic decapod Crustacea". Nature. 263 (5580): 764–765. Bibcode:1976Natur.263..764L. doi:10.1038/263764a0. PMID 995187. ^ "Copper for life – Vital copper". Association for Science Education. ^ Shona Mcsheehy & Zoltán Mester (2004). "Arsenic speciation in marine certified reference materials". Journal of Analytical Atomic Spectrometry. 19 (3): 373–380. doi:10.1039/b314101b. ^ a b c Dale Tshudy & Loren E. Babcock (1997). "Morphology-based phylogenetic analysis of the clawed lobsters (family Nephropidae and the new family Chilenophoberidae)". Journal of Crustacean Biology. 17 (2): 253–263. doi:10.2307/1549275. JSTOR 1549275. ^ "Extremely rare split-colored lobster caught off Maine". USA TODAY. Retrieved March 10, 2019. ^ writer, Josh Linehanstaff (August 29, 2018). "Rare ghost lobster caught off Stonington". Press Herald. Retrieved March 10, 2019. ^ "Why Do Crabs and Lobsters Turn Red When You Cook Them?". mentalfloss.com. August 29, 2012. Retrieved March 25, 2019. ^ "2 of rarest of all lobsters caught 5 days apart". USA TODAY. Retrieved March 11, 2019. ^ "Orange, yellow, blue, and even 'Halloween': The rarest lobster colors, explained". Boston.com. September 13, 2017. Retrieved March 11, 2019. ^ News, A. B. C. (September 1, 2017). "Rare white 'translucent' lobster caught by Maine fisherman". ABC News. Retrieved March 11, 2019. ^ Collman, Ashley. "A Maine fisherman caught a rare 'ghost' lobster that's nearly see-through". INSIDER. Retrieved March 11, 2019. ^ Farber, Madeline (August 8, 2018). "Maine chef finds rare cotton candy-colored lobster in tank". Fox News. Retrieved March 11, 2019. ^ "Why This Rare Lobster Is Colored Like Blue Cotton Candy". National Geographic News. June 19, 2018. Retrieved March 11, 2019. ^ Chang, Kenneth (March 15, 2005). "Yes, It's a Lobster, and Yes, It's Blue". The New York Times. ISSN 0362-4331. Retrieved March 11, 2019. ^ "1-in-2M find: 14-year-old, dad nab blue lobster". USA TODAY. Retrieved March 11, 2019. ^ Anderson, Jessica. "Rare 'calico lobster' found at Maryland seafood counter". baltimoresun.com. Retrieved March 11, 2019. ^ "Rare calico lobster turns up at Maryland fish market". WTKR.com. January 15, 2019. Retrieved March 11, 2019. ^ Press, Associated (June 7, 2018). "Flashy orange lobster is a 1-in-30-million rarity". Press Herald. Retrieved March 11, 2019. ^ a b "More Than 1 in 50 Million Lobsters Are Split-Colored Lobsters". Azula - For the Love of Oceans. February 23, 2018. Retrieved March 11, 2019. ^ Kennedy, Kelsey (September 1, 2017). "A Rare Yellow Lobster Joins a Boston Aquarium's Lobster Rainbow". Atlas Obscura. Retrieved March 11, 2019. ^ "Halloween Lobster Sports Orange and Black". National Geographic Society Newsroom. November 1, 2012. Retrieved March 11, 2019. ^ "Lobster all dressed up for Halloween in orange and black". Boston.com. October 31, 2012. Retrieved March 11, 2019. ^ "Extremely rare split-colored lobster caught off Maine". USA TODAY. Retrieved March 11, 2019. ^ T. Wolff (1978). "Maximum size of lobsters (Homarus) (Decapoda, Nephropidae)". Crustaceana. 34: 1–14. doi:10.1163/156854078X00510. ^ Kilada, Raouf; Bernard Sainte-Marie; Rémy Rochette; Neill Davis; Caroline Vanier; Steven Campana. "Direct determination of age in shrimps, crabs, and lobsters". Canadian Journal of Fisheries and Aquatic Sciences. NRC Research Press, a division of Canadian Science Publishing. doi:10.1139/cjfas-2012-0254#.VJfH2D_ts (inactive February 18, 2019). ^ Canfield, Clarke (November 30, 2012). "Lobster age shown by counting its rings like a tree, study reveals". The Huffington Post. TheHuffingtonPost.com, Inc. Archived from the original on January 28, 2015. Retrieved December 22, 2014. ^ Cong YS (2002). "Human Telomerase and Its Regulation". Microbiology and Molecular Biology Reviews. 66 (3): 407–425. doi:10.1128/MMBR.66.3.407-425.2002. PMC 120798. PMID 12208997. ^ Wolfram Klapper; Karen Kühne; Kumud K. Singh; Klaus Heidorn; Reza Parwaresch; Guido Krupp (1998). "Longevity of lobsters is linked to ubiquitous telomerase expression". FEBS Letters. 439 (1–2): 143–146. doi:10.1016/S0014-5793(98)01357-X. ^ Jacob Silverman (July 5, 2007). "Is there a 400 pound lobster out there?". howstuffworks. ^ Wallace, David Foster (August 2004). "Consider the Lobster". Gourmet. Archived from the original on September 17, 2008. Retrieved January 11, 2018. Reprinted as Wallace, David Foster (2005). "Consider the Lobster". Consider the Lobster and Other Essays. Little, Brown & Company. ISBN 978-0-316-15611-0. ^ Koren, Marina (June 3, 2013). "Don't Listen to the Buzz: Lobsters Aren't Actually Immortal". Smithsonian. ^ "biotemp". Archived from the original on February 11, 2015. ^ C. K. Govind (1995). "Muscles and their innervation". In Jan Robert Factor (ed.). Biology of the Lobster Homarus americanus. San Diego, CA: Academic Press. pp. 291–312. ISBN 978-0-12-247570-2. ^ "Heaviest marine crustacean". Guinness World Records. Archived from the original on May 28, 2006. Retrieved August 3, 2006. ^ "Giant lobster landed by boy, 16". BBC News. June 26, 2006. ^ "Homarus americanus, Atlantic lobster". MarineBio.org. Retrieved December 27, 2006. ^ Jason McLure (December 3, 2012). "Cruel new fact of crustacean life: lobster cannibalism". Reuters. Retrieved December 5, 2012. ^ "The American lobster – frequently asked questions". St. Lawrence Observatory, Fisheries and Oceans Canada. October 19, 2005. Archived from the original on March 10, 2010. ^ a b M. Obst, P. Funch & G. Giribet (2005). "Hidden diversity and host specificity in cycliophorans: a phylogeographic analysis along the North Atlantic and Mediterranean Sea". Molecular Ecology. 14 (14): 4427–4440. doi:10.1111/j.1365-294X.2005.02752.x. PMID 16313603. ^ "How It Works Magazine". ^ "Mercury Levels in Commercial Fish and Shellfish". Food and Drug Administration. Retrieved November 20, 2015. ^ Colin Woodard (2004). The Lobster Coast. New York: Viking/Penguin. pp. 170–180. ISBN 978-0-670-03324-9. ^ "The Lobster Institute: History". The Lobster Institute at the University of Maine. Archived from the original on September 7, 2006. Retrieved June 11, 2012. ^ "18 Ocean and Coastal Law Journal 2012-2013". heinonline.org. Retrieved January 26, 2019. ^ Townsend, Elisabeth (January 1, 2012). Lobster: A Global History. Reaktion Books. ISBN 978-1-86189-995-8. ^ "Lobster". All About Maine. Secretary of State of Maine. Retrieved July 29, 2013. ^ a b Johnson, Paul (2007). "Lobster". Fish Forever: The Definitive Guide to Understanding, Selecting, and Preparing Healthy, Delicious, and Environmentally Sustainable Seafood. John Wiley & Sons. pp. 163–175. ISBN 978-0-7645-8779-5. ^ a b Yue, S. (2008). "The welfare of crustaceans at slaughter". Impacts on Farm Animals. Humane Society of the United States. ^ Bruce Johnston (March 6, 2004). "Italian animal rights law puts lobster off the menu". London: The Daily Telegraph. ^ McSmith, A. (2009). "I'll have my lobster electrocuted, please". The Independent (Newspaper). Retrieved June 14, 2013. ^ "CrustaStun: The 'humane' gadget that kills lobsters with a single jolt of electricity". MailOnline (Newspaper). 2010. Retrieved June 14, 2013. ^ Tori Weldon. "Swiss ban against boiling lobster alive brings smiles — at first". CBC News. ^ "Switzerland bans crustacean cruelty". SWI swissinfo.ch. ^ Francesca Street (January 12, 2018). "Switzerland bans boiling lobsters alive". CNN Travel. ^ Asbjørn Drengstig, Tormod Drengstig & Tore S. Kristiansen. "Recent development on lobster farming in Norway – prospects and possibilities". UWPhoto ANS. Archived from the original on October 4, 2003. ^ "Riddles, Trivia and More". Gulf of Maine Research Institute. February 24, 2012. Retrieved July 23, 2012. ^ Dale Tshudy; W. Steven Donaldson; Christopher Collom; Rodney M. Feldmann; Carrie E. Schweitzer (2005). "Hoploparia albertaensis, a new species of clawed lobster (Nephropidae) from the Late Coniacean, shallow-marine Bad Heart Formation of northwestern Alberta, Canada". Journal of Paleontology. 79 (5): 961–968. Bibcode:1974JPal...48..524M. doi:10.1666/0022-3360(2005)079[0961:HAANSO]2.0.CO;2. ^ Tin-Yam Chan (2010). "Annotated checklist of the world's marine lobsters (Crustacea: Decapoda: Astacidea, Glypheidea, Achelata, Polychelida)" (PDF). The Raffles Bulletin of Zoology. Suppl. 23: 153–181. Archived from the original (PDF) on March 16, 2012. Phillips, Bruce F., ed. (2006). Lobsters: Biology, Management, Aquaculture and Fisheries. Wiley. doi:10.1002/9780470995969. ISBN 978-1-4051-2657-1. Townsend, Elisabeth (2012). Lobster: A Global History. London: Reaktion Books. ISBN 978-1-86189-794-7. The American lobster (Homarus americanus) is a species of lobster found on the Atlantic coast of North America, chiefly from Labrador to New Jersey. It is also known as Atlantic lobster, Canadian lobster, true lobster, northern lobster, Canadian Reds, or Maine lobster. It can reach a body length of 64 cm (25 in), and a mass of over 20 kilograms (44 lb), making it not only the heaviest crustacean in the world, but also the heaviest of all living arthropod species. Its closest relative is the European lobster Homarus gammarus, which can be distinguished by its coloration and the lack of spines on the underside of the rostrum. American lobsters are usually bluish green to brown with red spines, but several color variations have been observed. Bisque is a smooth, creamy, highly seasoned soup of French origin, classically based on a strained broth (coulis) of crustaceans. It can be made from lobster, langoustine, crab, shrimp, or crayfish. Ectrodactyly, split hand, cleft hand, derived from the Greek ektroma (abortion) and daktylos (finger) involves the deficiency or absence of one or more central digits of the hand or foot and is also known as split hand/split foot malformation (SHFM). The hands and feet of people with ectrodactyly (ectrodactyls) are often described as "claw-like" and may include only the thumb and one finger (usually either the little finger, ring finger, or a syndactyly of the two) with similar abnormalities of the feet.It is a rare form of a congenital disorder in which the development of the hand is disturbed. It is a type I failure of formation – longitudinal arrest. The central ray of the hand is affected and usually appears without proximal deficiencies of nerves, vessels, tendons, muscles and bones in contrast to the radial and ulnar deficiencies. The cleft hand appears as a V-shaped cleft situated in the centre of the hand. The digits at the borders of the cleft might be syndactilyzed, and one or more digits can be absent. In most types, the thumb, ring finger and little finger are the less affected parts of the hand. The incidence of cleft hand varies from 1 in 90,000 to 1 in 10,000 births depending on the used classification. Cleft hand can appear unilateral or bilateral, and can appear isolated or associated with a syndrome. Split hand/foot malformation (SHFM) is characterized by underdeveloped or absent central digital rays, clefts of hands and feet, and variable syndactyly of the remaining digits. SHFM is a heterogeneous condition caused by abnormalities at one of multiple loci, including SHFM1 (SHFM1 at 7q21-q22), SHFM2 (Xq26), SHFM3 (FBXW4/DACTYLIN at 10q24), SHFM4 (TP63 at 3q27), and SHFM5 (DLX1 and DLX 2 at 2q31). SHFM3 is unique in that it is caused by submicroscopic tandem chromosome duplications of FBXW4/DACTYLIN. SHFM3 is considered 'isolated' ectrodactyly and does not show a mutation of the tp63 gene. Homarus gammarus, known as the European lobster or common lobster, is a species of clawed lobster from the eastern Atlantic Ocean, Mediterranean Sea and parts of the Black Sea. It is closely related to the American lobster, H. americanus. It may grow to a length of 60 cm (24 in) and a mass of 6 kilograms (13 lb), and bears a conspicuous pair of claws. In life the lobsters are blue, only becoming "lobster red" on cooking. Mating occurs in the summer, producing eggs which are carried by the females for up to a year before hatching into planktonic larvae. Homarus gammarus is a highly esteemed food, and is widely caught using lobster pots, mostly around the British Isles. Larry The Lobster was the subject of an April 10, 1982 comedy sketch by Eddie Murphy on Saturday Night Live. The characters in the American animated television series SpongeBob SquarePants were created by artist, animator, and former marine biologist Stephen Hillenburg. The series chronicles the adventures of the title character and his various friends in the fictional underwater city of Bikini Bottom. Most characters are anthropomorphic sea creatures based on real-life species. Many of the characters' designs originated in an unpublished educational comic book titled The Intertidal Zone, which Hillenburg created in 1989. SpongeBob SquarePants features the voices of Tom Kenny, Bill Fagerbakke, Rodger Bumpass, Clancy Brown, Mr. Lawrence, Jill Talley, Carolyn Lawrence, Mary Jo Catlett and Lori Alan. Most one-off and background characters are voiced by Dee Bradley Baker, Sirena Irwin, Bob Joles, Mark Fite and Thomas F. Wilson. In addition to the series' regular cast, various celebrities from a wide range of professions have voiced guest characters and recurring roles. The show's characters have received positive critical reception and attention from celebrities. They have made frequent appearances in media outside of the television show, including a theatrical film series and many video games. The characters have also been referenced and parodied throughout popular culture. The title character SpongeBob became a merchandising icon during the height of the show's second season and has seen continued commercial popularity. The lobster-tailed pot helmet, also known as the zischägge, horseman's pot and harquebusier's pot, was a type of post-Renaissance combat helmet. It became popular in Europe, especially for cavalry and officers, from c. 1600; it was derived from an Ottoman Turkish helmet type. The helmet gradually fell out of use in most of Europe in the late 17th century; however, the Austrian heavy cavalry retained it for some campaigns as late as the 1780s. Lobster Johnson (also known as the Lobster) is a fictional character featured in the Hellboy and Bureau for Paranormal Research and Defense comic books published by Dark Horse Comics. He was created by Mike Mignola. Within the Hellboy universe, the Lobster was a vigilante who worked in secret in New York City during the 1930s. Although the public believes that the Lobster was only the hero of pulp serials and comics, he was a real man who faced gangsters as well as paranormal threats. The Lobster had a reputation for violence, such as killing mobsters and burning his trademark lobster claw symbol into their foreheads with the palm of his gloved hand. This behavior was similar to the Marvel UK comic book character Night Raven, and the pulp magazine hero The Spider. Lobster Johnson appeared in the 2019 Hellboy reboot, portrayed by Thomas Haden Church. Lobsters are widely fished around the world for their meat. They are often hard to catch in large numbers, but their large size can make them a profitable catch. Although the majority of the targeted species are tropical, the majority of the global catch is in temperate waters. A lobster roll is a sandwich native to New England and the Canadian Maritimes. It is made of lobster meat served on a grilled hot dog-style bun with the opening on the top rather than the side. The filling may also contain butter, lemon juice, salt and black pepper, with variants made in some parts of New England replacing the butter with mayonnaise. Other versions may contain diced celery or scallion. Potato chips or french fries are the typical sides. A lobster trap or lobster pot is a portable trap that traps lobsters or crayfish and is used in lobster fishing. In Scotland (chiefly in the north), the word creel is used to refer to a device used to catch lobsters and other crustaceans. A lobster trap can hold several lobsters. Lobster traps can be constructed of wire and wood, or metal and netting or rigid plastic. An opening permits the lobster to enter a tunnel of netting or other one-way device. Pots are sometimes constructed in two parts, called the "chamber" or "kitchen", where there is bait, and exits into the "parlour", where it is trapped from escape. Lobster pots are usually dropped to the sea floor about a dozen at a time, and are marked by a buoy so they can be picked up later. Nephrops norvegicus, known variously as the Norway lobster, Dublin Bay prawn, langoustine (compare langostino) or scampi, is a slim, orange-pink lobster which grows up to 25 cm (10 in) long, and is "the most important commercial crustacean in Europe". It is now the only extant species in the genus Nephrops, after several other species were moved to the closely related genus Metanephrops. It lives in the north-eastern Atlantic Ocean, and parts of the Mediterranean Sea, but is absent from the Baltic Sea and Black Sea. Adults emerge from their burrows at night to feed on worms and fish. Red Lobster Hospitality LLC is an American casual dining restaurant chain headquartered in Orlando, Florida. The company has operations across the United States, and internationally in Ecuador, Canada, Malaysia, Saudi Arabia, the United Arab Emirates, Qatar, Mexico, and Japan. As of February 24, 2013, the company had 705 locations worldwide. Golden Gate Capital has been Red Lobster's parent company since it was acquired from Darden Restaurants on July 28, 2014.On August 6, 2014, Red Lobster announced their new headquarters location in CNL Center City Commons in Orlando. On March 6, 2015, Red Lobster officially opened the Restaurant Support Center. Slipper lobsters are a family (Scyllaridae) of about 90 species of achelate crustaceans, in the Decapoda Reptantia, found in all warm oceans and seas. They are not true lobsters, but are more closely related to spiny lobsters and furry lobsters. Slipper lobsters are instantly recognisable by their enlarged antennae, which project forward from the head as wide plates. All the species are edible, and some, such as the Moreton Bay bug and the Balmain bug (Ibacus peronii) are of commercial importance. Spiny lobsters, also known as langustas, langouste, or rock lobsters, are a family (Palinuridae) of about 60 species of achelate crustaceans, in the Decapoda Reptantia. Spiny lobsters are also, especially in Australia, New Zealand, Ireland, South Africa, and the Bahamas, called crayfish, sea crayfish, or crawfish ("kreef" in South Africa), terms which elsewhere are reserved for freshwater crayfish. Squat lobsters are dorsoventrally flattened crustaceans with long tails held curled beneath the cephalothorax. They are found in the two superfamilies Galatheoidea and Chirostyloidea, which form part of the decapod infraorder Anomura, alongside groups including the hermit crabs and mole crabs. They are distributed worldwide in the oceans, and occur from near the surface to deep sea hydrothermal vents, with one species occupying caves above sea level. More than 900 species have been described, in around 60 genera. Some species form dense aggregations, either on the sea floor or in the water column, and a small number are commercially fished. The Lobster is a 2015 absurdist dystopian black comedy film directed, co-written, and co-produced by Yorgos Lanthimos, co-produced by Ceci Dempsy, Ed Guiney, and Lee Magiday, and co-written by Efthimis Filippou. In the film's setting, single people are given 45 days to find a romantic partner or otherwise be turned into animals. It stars Colin Farrell as a newly single man trying to find someone so he can remain human, and Rachel Weisz as a woman with whom he attempts to form a relationship. The film is a co-production by Ireland, the United Kingdom, Greece, France and the Netherlands. It was selected to compete for the Palme d'Or at the 2015 Cannes Film Festival and won the Jury Prize. It was shown in the Special Presentations section of the 2015 Toronto International Film Festival. The film was nominated for Best Original Screenplay at the 89th Academy Awards and for Outstanding British Film at the 69th British Academy Film Awards.